The Dot Tee is named for its airy polka dot fabric – an easy 2x2 rib with a yarn-over skip. This is a hip length tee with waist shaping created from gradual decreases, then increases, tucked into the vertical purl stripes along each side. Its neckline is a wide crew. 2 sleeve length options are included – a short cap and three-quarter – for multi season wear-ability. 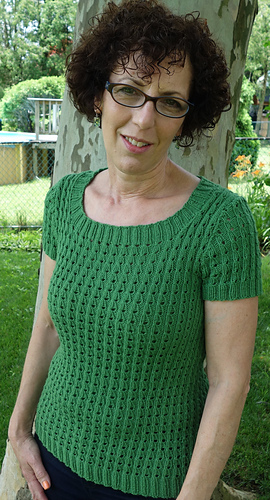 This piece is worked in the round, from the bottom up, until the armholes where it splits and is worked back and forth. Stitches are picked up around the neckline for rib trimming that continues from the repeat of its bodice. Set-in sleeves are worked flat from the bottom up and seamed. • Short sleeve version: 5, 6, 6, 7, 8, 8, 9 skeins, or for comparable yarn, approx 855, 975, 1085, 1195, 1315, 1430, 1540 yards / 785, 895, 995, 1095, 1205, 1310, 1410 m.
• Three-quarter sleeve version: 7, 7, 8, 9, 10, 11, 12 skeins, or for comparable yarn total approximately 1105, 1265, 1410, 1560, 1735, 1910, 2065 yards / 1010, 1160, 1290, 1430, 1590, 1750, 1890 m.
Long-tail CO, circular knitting, decreases (ssk, k2tog, skp, p2tog, p2tog tbl), increases (yo, p1-f/b, m1R, m1L, m1pR, m1pL), short row shaping and 3-needle BO at shoulders, stitch pick up around neckline, blocking, and seaming (sleeve cap into armholes). 11 page pdf includes pattern instructions, lace description and chart with tips for lace shaping, photographs, schematics, and definitions for relevant abbreviations.